SO OUR team has sailed for Barbados under the management of George Radix. Taking it all round I foresee a series of wins for our men unless Barbados has greatly improved since last year. With Nathaniel (Sporting Club) in goal, A. Charles (Everton) and Arrindell (Sporting Club) backs; Halfhide (Sporting Club) M. Achong (St. Mary's) and Agard (Sporting Club) as halves; Daniel (Maple), H. Achong (Maple), C. Mathieu (Shamrock), Rouchet (St. Mary's) and F. Oharles (Everton) in the forward line, Barbados will face a side that is fairly representative of Trinidad at full strength, and one that would prove too strong for any other local side, Casuals of 1929 included. PERHAPS I am wrong in calling the series of football matches test matches but at any rate they will try out the respective strength of the two Islands, and should prove the forerunner of an intercolonial series on the lines of Cricket contests. The first match takes place to-day and will be followed by four others on May 3, 5, 8 and 10 respectively. 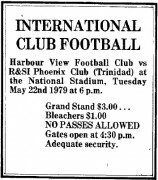 It may be of interest to note that the prices of entry to the ground range from the humble six cents to a shilling and sixpence. T.A.F.A. please note.